Mark Fistric | Stop Hitting Robidas! This is something that was originally supposed to be a regular feature last season that I’m going to bring back to a lesser extent this season. If you’re curious on exactly what this feature is, here is our Intro to Chemistry. What happened to the Dallas Stars’ penalty kill? During the preseason, they had absolutely no problems killing off penalties. Then we hit the regular season and they start coughing up power play goals to the other team left and right. What happened? In five games, they’ve already allowed 10 power play goals (on 25 attempts), with 8 of those goals coming in the three road games so far. Four of the goals happened Monday in Tampa Bay. Ouch. That’s a very, very leaky ship they’re trying to sail. I spent some time after the game staring at numbers. What I found out is that two of the Stars’ leading penalty killers in preseason have not played a second of shorthanded time in the regular season. One of them is Severin Blindenbacher, who played over 10 minutes in the three of the four games I focused on without seeing a single power play goal against. In two of those games, he was part of the leading defensive pair on the PK that night, with either Fistric or Grossman, which saw a combined 13 penalties against with 0 PPGA. He is now playing for the Texas Stars in the AHL. The other is Aaron Gagnon, recently called up from the Texas Stars. He played mostly with Toby Petersen on the penalty kill during the preseason and faced over 12 minutes total in the four games. The Dallas Stars killed off 25 of 27 penalties in those games, and Gagnon was not on the ice for either of the two goals they allowed. Of course, you’d want those two guys to have more NHL experience before you throw them out there shorthanded. That said, it would be nice to see the Stars give Gagnon a shift or two with Petersen and see if they can recreate some of the success they had in preseason against real NHL rosters. Another player that had some success killing penalties in preseason was Brian Sutherby. He had limited ice time but was not out for a single power play goal against. However, he has only been given 4:36 SH TOI in the regular season despite having only been on the ice for one PPGA, which came during the Detroit game. While that was partially his fault, you can’t overlook the fact that he had almost 2 minutes on the PK Monday and was one of two players who logged over a minute of SH time and did not get scored on. The other player was Steve Ott. Am I saying Sutherby should be playing big minutes killing penalties? Not at all. Could he take a few shifts from a player like Brenden Morrow who is an adequate penalty killer but may have better ways to spend that ice time? Sure. This brings me to my main point, which is that it is not really the forwards I have a problem with as far as personnel goes. It is more important to find the right combination of guys like Sutherby, Burish, and Wandell, who have so far been fairly interchangeable when it comes to successfully killing penalties, than it is to figure out who is better. For the defensemen, however, there is a big glaring issue that I see. Trevor Daley has managed to be on the ice for HALF of the power play goals against (and is leading the team in that regard). To put that into perspective, he allows a goal for approximately every 3:30 he plays shorthanded, or once per game. He is horribly ineffective, and yet is second only to Karlis Skrastins for SH TOI. There is no reason that I can see not to give some of his penalty killing time to Mark Fistric or Matt Niskanen. At least they don’t look completely startled every single time the puck comes at them. How many times have we already seen Daley do something completely boneheaded that cost the Stars on the scoreboard? He has no awareness of himself in relation to Lehtonen, as evidenced by all the screening, skating into, and deflecting pucks past that he’s already displayed this season. Moving away from the “who” to the “what” problem, that seems pretty simple. For some reason, the Stars have been completely unable to get the puck ALL the way out of their zone on the penalty kill. One of them will pick it up down low and try to clear it, only to have it caught by the other team and tossed right back in. It doesn’t seem to matter much how they try to get it out. Down the middle? Bad giveaway. Along the boards? Caught at the point, if not before. Carry it out? Swarmed and had it stolen. Someone needs to sit down and come up with a gameplan for getting the puck out of the zone on the first try. Maybe go over video of the Capitals, who have successfully killed off 21 of 21 penalties. Or maybe just pay very close attention Thursday when they take on the Panthers, who have only taken 8 penalties and have killed off all of them. For anyone who is unfamiliar with SHR +/-, it’s how Kristine and I rate the Dallas Stars players after every game. We use a standard +3 for goals and +2 for assists. Other things like being a good teammate or doing something with style will usually get them +1. We’ll take away points for things like really bad giveaways, stupid penalties, and so on. Sometimes the good and the bad cancel out, so the player ends up with +0. The table here shows everyone’s totals, the top and bottom players, and past winners and losers. All three of Reinprecht’s goals came while the Morrow-Ribeiro-Benn line was on the ice. The Stars recovered from a 3-0 deficit to force overtime, but were once again unable to score in the shootout. The game was head coach Marc Crawford’s 1000th behind an NHL bench. Ribeiro’s line was a combined -9, while Wandell’s (with Brunnstrom and Sutherby) was a combined +6. Wandell’s line also combined for 2 goals and 4 assists, including Brunnstrom’s first goal this season. James Neal lead the team with 6 hits. Stephane Robidas and Karlis Skrastins each had 5 blocked shots. Conclusion: The Stars are not going to make the playoffs if they continue to play below their ability every time they face the Eastern Conference. Alex Auld played in both back-to-back games due to Marty Turco being out with flu-like symptoms. The Morrow-Ribeiro-Benn line was a combined -6, while the Sutherby-Wandell-Brunnstrom line managed a combined +3. Wandell’s line accounted for half of the Stars’ scoring (1 g, 2a). Wandell also tied for the lead (with Mark Fistric) in blocked shots with 3. Conclusion: The Stars’ power play had the opportunity to put the game away for the second time in two games, but came up short. The top two lines need some rearranging if Dallas wants to get more than 1 out of every 4 available points. Hopefully the return of Modano and Lehtinen can help stabilize the team while they get back on track. For games 10 and 11 for the Dallas Stars, there really wasn’t much to say, hence the lack of actual game review. The Stars were down 4-1 entering the third, but forced overtime thanks to goals from Benn, Fistric, and Neal. Mark Fistric’s goal was his first NHL goal. Benn has now scored in both games against the Kings. Stars power play continued to struggle, unable to cash in on 4 chances in the first two periods. Steve Ott lead in hits with 6. The only forward to block a single shot was Loui Eriksson. Conclusion: It was rather nice to get the extra point, but giving the Kings 4 out of the available 4 points in the two games so far this season is not. Krys Barch, Brian Sutherby, and Steve Ott each had a fight. None of them really won. Ott had the Blues very distracted, drawing 6 minor penalties. The Blues also took 4 roughing and 2 cross checking minors, along with a 10 minute misconduct and a game misconduct. The Stars, meanwhile, took 1 roughing, 1 unsportsmanlike conduct, 1 cross checking and 1 kneeing penalty. Both teams also had a small handful of hooking minors. In all of that, only one power play goal was scored. Jeff Woywitka got his first point with the Stars against his old team. However, he also unintentionally aided the Blues in ruining Turco’s shutout. Oops. Toby Petersen lead the team with 5 shots on goal. Conclusion: It was a messy game and the Stars could have blown out the Blues had it not been for Conklin’s 21 saves in the first two periods. Despite the penalty madness, it was maybe the best three consecutive periods of hockey Dallas has managed all season. Continuing their new habit of stealing wins on the road, the Stars roared into Anaheim and whipped up on some zombie Ducks for the better part of two periods. It was a relief for Dallas fans to see the other team sleepwalking after that slight embarrassment against the Kings. They gained a lead late in the first with a great shift from Wandell’s line. The rookie center moved up in between James Neal and Loui Eriksson, who both seemed to be struggling to create offense without Brad Richards. The goal itself was classic Eriksson, who was fighting for position in the crease and found space to shove Neal’s rebound past Jonas Hiller. The pressure continued in the second period, when Stars fans were treated to a flash of the Ribeiro-Morrow brilliance that was sorely missing last season. It happened when Hiller attempted to play the puck, only to have his pass intercepted by Ribeiro, who proceeded to immediately slide it straight to Brenden Morrow. The entire play was so quick and effortless that Hiller couldn’t even recover before the puck was in the net. Moments later, Evgeny Artyukhin pulled a very cheap move on defenseman Matt Niskanen, kicking his feet out from under him mid-check. As a result, Niskanen’s head hit the ice as he landed. Despite getting up on his own, he left the game and is now out with a head injury. Not only did the officials neglect to call a penalty on the play, they called a crosschecking penalty on Sutherby when he tried to hold Artyukhin accountable for his actions. Dallas responded by killing off that penalty and breaking their power play drought on the next Anaheim penalty. This one was thanks to Trevor Daley, who found his sweet spot in the high circle and whipped a shot past Hiller. Despite stepping off the gas and allowing goals from Ryan Getzlaf and Joffrey Lupul, the Stars held onto their lead thanks to some hard work by Marty Turco. He stopped 13 of 14 third period shots and did not allow the Ducks to tie it. When they pulled their goalie, Ott was able to seal the win with an empty net goal. The game was Morrow’s 600th career game (all with the Stars), so it was fitting that #10 scored the goal that moved him into the 10th spot on all-time Stars goalscoring. Congrats! Despite a somewhat slow start, Eriksson is on pace to score 36 goals again this season. If Morrow were to stay scoring goals at the same pace he’s at, he’d breach 50 by the end of the season. Nicklas Grossman continues to lead the league in +/-. More Anaheim homerism: the Ducks outhit the Stars 30-11. Steve Ott was only credited with 2 hits, when he almost certainly had more than that in the first period alone. Mark Fistric and Jamie Benn were the only Stars to have more than 1 blocked shot, with 3 and 2 respectively. Francis Wathier, playing in his NHL debut, looked solid and got a good fight in against Mike Brown. Conclusion: A good win. Came very close to stringing together 3 periods of solid play. Getting Ott back was big, and it was nice to see more than one line creating chances. 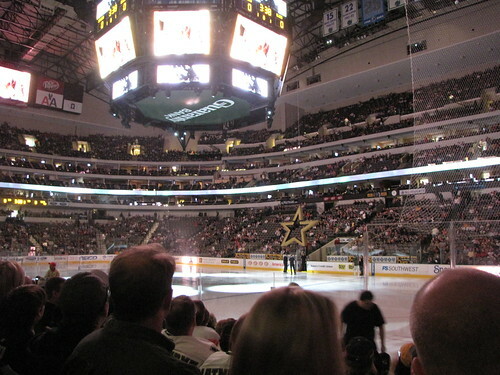 It was a pretty disappointing loss for the Stars’ first game against a divisional opponent. We were at the game, and by the end of it, we were sitting there seeing if we could count all the players we weren’t annoyed at on one hand. We could. Easily. Mike Ribeiro: Wore the ‘A’ with Lehtinen, Richards, Modano, and Ott out. He wore it well. His attitude about taking a step towards becoming more of a leader (as he told Razor about during intermission) was great. Brenden Morrow: Nifty pass to set up Benn in the first. Some nice hits later in the game. It’s too bad the rest of the team didn’t pick up on his energy. Jamie Benn: He had his share of turnovers, but without him, the game is another 3-0 shutout. Alex Auld: Sat on the bench really well. No turnovers or anything! Karlis Skrastins: Think about how you felt when Sydor came out to kill a penalty and compare it to how you feel when Skrastins is on the ice PKing. Yeah. Stars power play giving us all a headache. Just because Toby Petersen rocked the point in Iowa forever ago doesn’t mean he works there in the NHL. Ribeiro and Wandell totally forgetting how to win a faceoff. The top defensive pairing sitting in the box together while the Stars try to kill off a 5-on-3. Then..
Getting scored on with only 7 seconds of penalty kill left. Ouch. Matt Niskanen, Tom Wandell, and Fabian Brunnstrom’s -2. Trevor Daley leading defensemen in giveaways. Brunnstrom and Benn are relatively new at this. What’s Daley’s excuse for making rookie mistakes? Us going from “James Neal is a BEAST” to actually wishing the team could afford to bench him for a few shifts to try and wake him up. Zombie Neal is not effective. Marty Turco’s handful of irritating moments, like every time he made us panic over his puckhandling on the PK. All things considered, it was still only one game and they have a chance to redeem themselves Wednesday and Thursday. One thing I was wondering about after the game though is why the team doesn’t seem able to win in front of Turco. In realizing that he is 1-2-3 (5 of 12 available points) compared to Auld’s 2-0-0 (4 of 4 points), and knowing they have almost equal stats, it is hard not to wonder what the difference is. The average time between goals Auld has allowed is right under 17 minutes. In fact, he hasn’t allowed a goal in the first period of either of his starts, and the shortest time between two goals allowed was approximately 11 minutes. He also has not allowed a goal when the Stars had anything less than a 2-goal lead. Not to say that all of his goals against were great or even okay, but there’s something to be said for timely saves. In comparison, Turco’s average time between goals is barely over 12 minutes, a time that seems to be decreasing (down from appr. 16 minutes apart in his first 3 starts) with each game. He has not allowed two goals further apart than 10 minutes in his last two starts, the closest together being less than 3 minutes apart. He’s allowed a goal in the first period in 4 of his 6 starts. Maybe most importantly, 14 of the 15 goals against Turco have come when the game is close (5 allowed the opposition to tie it, 6 allowed them to break the tie, and 3 gave them a 2-goal lead.) That’s all but the second Savard goal, which gave the Bruins a 3-0 lead. It will be interesting to revisit this idea once Auld has more than 2 starts to consider. Also: What is up with Richards being so delicate in Dallas? Mono, shoulder problems, a broken hand, a broken wrist, and now a sore groin? That trade must have irritated some hockey gods somewhere, because he’s had maybe 2 games here fully healthy. Perttu Lindgren played in his first NHL game and, like Aaron Gagnon, did absolutely nothing and has since been reassigned to Texas. Brenden Morrow led the team with 6 hits. Mark Fistric had 5 and Stephane Robidas had 4. Jamie Benn might have had 2 giveaways, but he also led the team with 3 takeaways. Ribeiro led the team in blocked shots with 3. The only other skaters to block any shots were Woywitka (1) and Skrastins (2). Ribeiro also had 3 hits, including a rather impressive one on Matt Greene in the third period. The Stars recap says this: “Defenseman Nicklas Grossman picked up an assist on Benn’s goal, extending his points streak to a career-high tying four games.” For anyone wondering how that’s possible given that the Stars got shut out 3 games ago… I don’t know either. Conclusion: You don’t make it to the playoffs by losing important games. Hopefully we’ll see more of the Games 1-5 Stars on this upcoming road trip than the Games 6-8 Stars. Well the funny thing about this back-to-back was that both of the teams spent every meeting last season completely embarrassing the Stars. For that reason, the general consensus here was that it’d be nice to at least get 2 points of the 4. Because the Boston game was on home ice and the first of the two, it seemed really important that the Stars play well. What really happened appeared to be more like the Stars slept right through the game against the Bruins so that they’d have lossa energy to take on Chicago with. Ribeiro took a dumb penalty in the first, the Bruins scored, and the game basically ended there with 47 minutes left to play. For insurance, though, the Bruins added another two goals and won the game 3-0. Turco couldn’t really be faulted for any of them, but also did not really come up with enough timely saves to keep them in the game. On a positive note, Aaron Gagnon (called up from the Texas Stars) played in his first ever NHL game. For having played the night before, he didn’t look so bad. He won 5 of 8 faceoffs and had a takeaway and a blocked shot (and no giveaways). Nicklas Grossman took a puck right in the face in the second period, but because he is 1/2 of the toughest defensive pairing in the league, he skated himself off the ice and returned in the third. All things considered, it was a pretty unlucky night to be anywhere near Stephane Robidas (at least 2 of the goals against deflected off of him). Brad Richards and a handful of other Stars had their point streaks broken. Because nobody scored. Which was sad. All of a sudden, the Dallas power play lost its power, going 0-for-3 despite the advantage coming at some pretty crucial points in the game. Mike Ribeiro had a rough night, as he took the Stars’ only penalty and was on the ice for both even strength goals against. He also won only 27% of his 15 faceoffs and only 1 of his 5 shots even got on goal. Rookie Jamie Benn actually led the Stars in blocked shots, with 3. He also had 3 takeaways and 2 giveaways. Robidas led the team with 6 hits. Conclusion: A stinker was bound to happen eventually, and while it is disappointing that it happened so early, it is also completely unsurprising that it was against the Bruins. Immediately following the Bruins game, the Stars packed up and headed to Chicago to play the Blackhawks. Ooh, the dreaded Blackhawks, unbeaten by Dallas since the 07-08 season. Ooh, and playing their second game in as many nights too. Ooh, the Stars would need some serious luck to make it out of this one with a win. Well… the Stars got a weird mix of luck, fortunate circumstance, and timely goaltending and actually managed to run off with the two points. First off on the list of oddities was seeing defensive defenseman Mark Fistric playing forward on a line with Petersen and Barch. Gagnon was a healthy scratch and Woywitka was paired with Niskanen. He didn’t look nearly as lost as you’d expect, and actually seemed to be enjoying it. Second, there was the play of Alex Auld. He was fantastic in the first period, stopping all 14 shots to keep the Stars in the game when they came out sleepwalking. However, for all his timely saves, he did have a few unfortunate moments. The second goal against came when Auld lost his footing behind the net, giving Toews an easy goal. The third gave the Hawks momentum to attempt to tie it by putting them within one goal with 5 minutes left to play. There was also James Neal. One of the best players for Dallas in the first 5 games all of a sudden looked completely lifeless. He had multiple noticeably lazy moments, including coughing the puck up at his own blueline and then standing there and watching while the Blackhawks scored. He ended the game -1, with only 2 shots, 2 hits, a giveaway and no takeaways or blocked shots. More strangeness included: Toby Petersen scoring, which was assisted by Fistric, meaning his first point of the season actually came as a forward. Skrastins, Niskanen, Grossman, and Robidas also all left with a point in the game, meaning 5 of 11 (if you include Fistric) points by Dallas players went to defensemen. A pane of glass fell out and into the stands during the game and play was held up as they waited for it to be replaced. Perhaps the oddest thing was the goal by which the Stars won, which came entirely on accident and suggested that whatever misfortune surrounded Robidas the night before seemed to have reversed. Robidas shot the puck from center ice, sending it along the glass in a routine dump into the Chicago zone. Instead of heading behind the net, however, it hit something and bounced out towards Cristobal Huet, who reached down to catch it. The puck had a different idea, all of a sudden springing up and over Huet’s glove, into the net. Though the game was won on a fluke and a fumble, the win was protected by some very very hard work from the Stars penalty kill. With Morrow in the box (stupidstupid) at 17:49 in the third for interference (stuuppiidddd), Chicago pulled their goalie and had 6 skaters against the Stars’ 4. Wandell and Eriksson in particular worked very hard to keep the puck away from Auld and Dallas made it out with the win. With that kill, the Stars successfully killed 8 of their last 9 penalties dating back to the Nashville game. In fact, they have not allowed a power play goal in any game in which Ribeiro was on the ice for at least 25% of the time shorthanded. I actually kept (approximate) track of how many times each player distinctly gained possession and removed the puck from their own zone during a penalty kill, and Ribeiro, Eriksson, and Neal combined for about 70%. Morrow, Wandell, and Robidas made up the other 30%. However, the Stars power play was not any better than Chicago’s. They had 5 opportunities (8 if you go back to the Boston game) and couldn’t score on any of them. Granted, Crawford played a pretty conservative power play as it probably didn’t seem worth risking the game (a Blackhawks SH goal would have really given them momentum) to try to increase their lead. Auld is now 2-0-0 and has been a game star in each game he’s started, even in preseason. Morrow got himself an extra 2 minutes after the final buzzer for sassing, apparently. Ribeiro, after promising after the Boston game that he would be better, had a goal and won 40% of his faceoffs. Fabian Brunnstrom was the only Star to end the game with a +2. He also assisted on the first goal when he won a puck battle and sent it to Morrow for a one-timer. That ^ is a little misleading, as Morrow’s one-timer was stopped, but he got his own rebound. Robidas led the team with 5 hits. That’s 11 in two nights, which is more than the majority of Stars have all season. Conclusion: It was a weird win, but getting two points and not giving any up to a Western opponent is nothing to look down on. Stars really need to build off this and string together a few more, though. Dallas penalty killing woes continued right through the end of their Western Canada road trip as Marty Turco allowed 2 power play goals that turned a 1-0 Stars lead into a 2-1 scramble that somehow resulted in a 4-3 shootout loss. As easy as it is to point to Turco for being a gigantic mess in the post-overtime skillsfest, chances are the Stars could have won at least one of their three OTL in regulation had their PK prevented just one of the goals scored. So who is to blame for the special teams struggle? I would propose that it is not the coaching or the players, but the actual personnel on the ice during a penalty kill. There was a moment during overtime where the Canucks had the Stars trapped in their own zone for what felt like forever. Dallas was all over the place and it seemed inevitable that they were about to get scored on. All of a sudden, Matt Niskanen (yeah, no, really) pinned one of the Vancouver forwards to the boards and kicked the puck away from him. Stars got it out of the zone and were able to change. That same Matt Niskanen has gotten all of 2:21 SH TOI this season, compared to Grossman, Skrastins, Robidas, and Daley who all have over 10 minutes already. Daley, Robidas and Grossman have all already been on the ice for at least three power play goals against each. Mark Fistric – 27:48, 0 GA.
Granted, anyone watching Stars games would see that the Grossman-Robidas pairing has been extremely solid at even strength. However, perhaps it’s time to cut their shorthanded minutes a little in favor of Niskanen or even Fistric. At forward, there seem to be some stereotypes causing confusion with who deserves time killing penalties. Brad Richards is a -58 in his career, and has not ended a season with a positive +/- since before the lockout. He has had 3 power play goals scored against him in his 5:23. He is hesitant to take the body and has blocked all of 41 shots since the start of the 07-08 season (that’s 134 games). While he is a fantastic player at even strength and with the man advantage, he should not be logging 5x the ice time short handed as Mike Ribeiro. Granted, Ribeiro has some dumb defensive moments as a result of his (sometimes overly) creative style of play. However, I believe 100% that when asked to play defense first and foremost, he does it with the same intelligence that he is so impressive with offensively. Ribeiro got 81:45 in SH TOI last season and saw only FIVE power play goals against. That’s only one every 16 minutes. If you assume he logged just 60 seconds each time the Stars were penalty killing, and the Stars took 4 penalties every game, it would have taken the other team 4 full games to score a PPG while Ribeiro was on the ice. It was his first season of getting regular shorthanded time. In comparison, Richards got 118:11 SH TOI last season and was on the ice for 14 PPGA. That’s one every 8 minutes, or twice as many as Ribeiro. Give Matt Niskanen and Mike Ribeiro a chance to take on more responsibility penalty killing, and the numbers will start to improve. Rookie Jamie Benn got his first NHL goal in front of his family and friends with only 1:33 left in regulation to tie the game and force overtime. Marty Turco is on a 5-game losing streak if you look back to last season. Jere Lehtinen returned from injury to play his first game of the season, but Steve Ott pulled an oblique muscle and is now out for an unknown amount of time. Mike Ribeiro, Brad Richards, Jamie Benn, and Stephane Robidas all have point streaks going. Conclusion: Marty Turco looked good, not great, but then stumbled again in the shootout. However, it seems that if the Stars fix their special teams problems without losing dominance at even strength, they won’t need to worry about games going into overtime. Kristine and I took some time to gather a collection of our favorite pictures from what is otherwise a fairly forgetful season. As the second round of the playoffs gets do-or-die (go Caps! go Canes! ), we’re going to take a moment to celebrate all the Stars’ good times that got buried beneath the shame of the season’s less-than-desirable end. You can’t help but smile at Brunnstrom’s “omgIscoredcomehugme” reaction to his NHL debut hat trick. We started calling Grossman “Saint Nick” after seeing this picture of him and his workshop elves. Months later, it’s still a favorite. Fistric catches up with Mittens. While everyone was busy questioning Modano’s ability to play, he was busy proving that he could still fly. Nobody liked seeing the Morrow-Ribeiro line broken up, so it was no surprise that their reunion brought many happy moments. Stephan replaced Turco in a 0-5 loss to the Devils. We really wish this had happened more often at this point of the season. He did have one good save, though. When Zubov returned from injury on 11/7, we all celebrated. When he went out again on 11/28, it was a little heartbreaking. 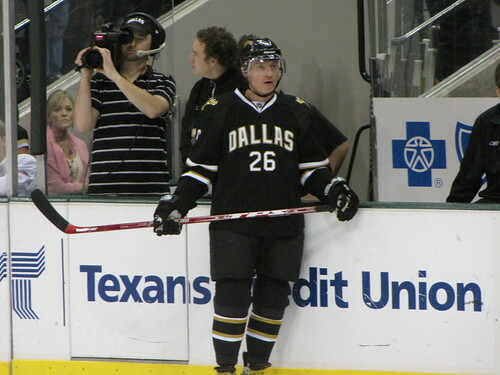 The 11/7 game against the Ducks was also Mark Parrish’s debut with the the Stars, in which he scored a hat trick. Ribs keepin’ us all entertained. These two really should have played together more often. They both had their struggles, but they definitely make us excited for the Stars’ future. Yes, this is a good moment. Did any of you reallllly want him in Dallas for four years? Loui’s first NHL hat trick, against Columbus. We predict many, many more to come. Neal’s first career hat trick, in Toronto. Parrish says goodbye to 2008 with a nice goal, making thousands of drunk Texans really happy. Tipp rewards Neal for a strong game by giving him his first NHL shootout attempt. He scores (awesomely) and wins the game. Everyone wows and suddenly the Stars have a new shootout specialist. By the end of the season, he’d scored on 5/7 attempts. …that they’re just ridiculously awesome. Not a good moment, but definitely a memorable picture. They were discussing Valentine’s Day gifts, I’m sure. Can’t help but wonder if Sydor looked at them and saw Lehtinen and Modano. Those familiar happy feelings that come with scoring on the Sharks. Grossman doesn’t score often, but when he does, leaping hugs will follow. He only played a few games at the end of the season, but by the time he’d finished his first shift he’d impressed us. That cannon shot from the point never failed to amaze. Lehtinen warms up for the last home game of the season. After the game, Stars waited to give their jerseys to fans.